This is part 3 of a flavor/educational review. There's only one more I plan after this, so I hope this isn't detracting from gameplay reviews. The name of this card is derived from Schwarze Kapelle (German, which translates to the same). It was a term used by the Gestapo to refer to conspirators within the German military who plotted to overthrow Adolf Hitler. These were highly patriotic Germans, who feared Hitler's reign would ruin Germany. They intended to overthrow the Nazi party to preserve German sovereignty. They hoped to preserve the gains already made by Hitler, not rejoining a democratic order of nations. They believed that Germany had gained significant power, and they sought to preserve it, believing Hitler's pride would eventually cause the country's downfall. Meanwhile, the Allies refused to accept the credibility of the Black Orchestra, believing them to be a front for the Gestapo. Unable to reconcile differences, the Black Orchestra drafted the blueprints for a system of government, based on the British Constitutional Monarchy. They also readied a coup, as a means of preventing an invasion of the Sudetenland. If Hitler gave the invasion order, the coup would begin, in order to stop him. However, as this order never came, the coup was aborted. With the Munich Agreement, Hitler garnered enough power that a successful coup would have been impossible. When Hitler later planned a controversial invasion of neutral lower countries into France, tensions within Germany grew again to the point the Black Orchestra planned yet another coup. However, faulty intelligence led the Black Orchestra to believe Hitler had found them out, resulting in aborting the plan and burning all related documents. It was some time until Hitler's popularity again fell, this time due to the failed Operation Barbarossa. However, the declaration by the Allies that they would accept nothing less than unconditional surrender pushed the German military into a corner, resulting in harsher tactics. The Black Orchestra's numbers had dwindled significantly, and one of their final attempts (in 1943) was to place a bomb on Hitler's plane, which failed to detonate..
On July 20, 1944, the Black Orchestra had its last crescendo (pun intended), as they attempted a direct assassination on Hitler in his "Wolf's Lair" field headquarters near East Prussia. The failure of this attempt led to the arrest of over 7,000 people by the Gestapo, of which over 4,900 were put to death. The flavor text of this card actually seems to coincide with the real-life events. Forced to extremes, the Black Orchestra members escalated their plans, from a bomb to a direct assassination. These acts, guided by their conscience to defend the honor and reputation of their country, led to their deaths. The code-cracking little brother of the new wall fracking star. I won't get long on the obvious : credit for credit, it's far to be as good. I won't consider the "install from heap" ability either. We know the corp counter comes along and that very good option is more risky from now. Let's see what it's worth as a new Anarch decoder. Anarchs used to deal with code gate with Yog.0 and Datasucker, then came some answers (Lotus Field first, but also Little Engine, Archangel, Wormhole and Cyberdex Virus Suite) and Anarchs were not really keen on casting the Force of Nature. (I still wonder why Yog joined the MWL soon after. Design space for low strength code gates, they said, as if Enigma, Quandary, Pop-up Window and Yagura didn't see play before). Whatever, Anarchs decided to sell their souls and swing a sling and they yoglessly crushed the meta. Until the MWL strikes again. 3 vs Lotus Field, just as good as Gordian Blade. not so against other code gate with 4 or 5 strength. Have a few sucker tokens and Yog shines again, but at least, you have a decent solution if you just get purged and the central are out your reach. Tollbooth really hurts Black Orchestra, but Tollbooth hurts everyone and everything. 6 strength code gates ? It becomes tough for Yogsucker, but Black Orchestra is decent again. Better than Gordian Blade against DNA Tracker by 1, worse against Archived Memories by 1. 7 strength code gate are tough for both of these solutions. It's probably a job for D4v1d. Decent. Just decent. 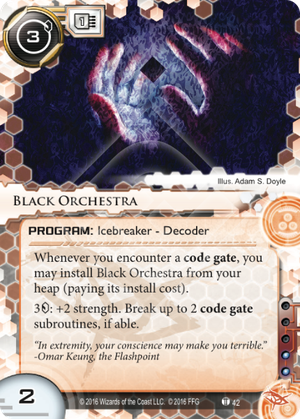 Black Orchestra is not the definitive decoder, but Anarchs don't have to have one. It's just an interesting option to fill a gap in their suite. The really odd bit with both this and Paperclip appears to be their connection to either Omar or Null. Coming along in the same block they should be one or the other's chosen programs but the install from heap aspect doesn't seem to help either one very much. Looking forward to the third part of this act, they might make a compelling setup for Exile: Streethawk if the influence costs don't break the bank for him.